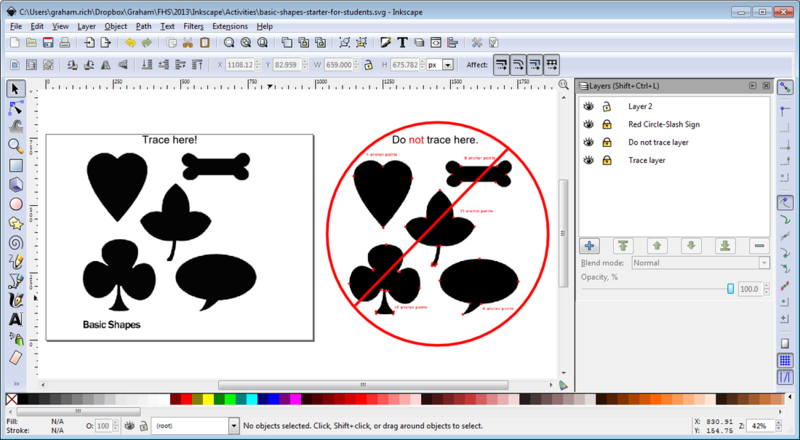 Learning to trace with vector graphics. Use a Stroke Width between 6 and 10. Use only the number of nodes from the samples (in the "Do not trace here" section). Be warned. The first two are much easier than the other! Take your time! If your handles (circles) disappear, you can hold down SHIFT and click-and-drag on the node to get them back! Here's a video to get you started with the Basic Shapes. Clicking to get the nodes and then going back later to clean up the curves. Using "Shift-ClickAndDrag" to get handles for nodes. A quick introduction to "Layers". Post this file on your "Vector Graphics" page (Weebly).